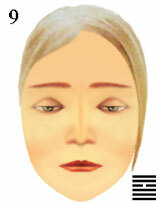 Gallery of cosmetic make-up and figures of emotional expressions. Visagistes and facial stylists should choose physiognomic symbols in gallery according to emotional image of a woman, and then cosmetic make-up will be natural and will not contradict emotions which surrounding people see in her face. Sad eyes seem covert as eyebrows and mouth express quiet emotions. Quiet eyebrows and mouth seem gloomy as eyes express sad emotions. Facial grief of the person is calm as in ideas there is no anxiety. In sad eyes it is possible to see indifference to world around as ideas and feelings are absent, but absence of sensations and denying of thoughts is caused by desires which cannot be executed. emotions of a woman for natural cosmetic make-up.